Remember the “good ole days” of flash cards? 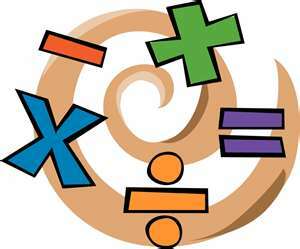 Ten years ago, when I first began teaching my children, that was how I taught math facts. Every day we would pull out the flash cards and drill, drill, drill. We’ve come a long way since that time. 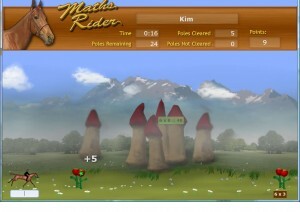 This month Andrew (2nd grade) has been reviewing his math facts while riding a horse called Shadow. He has been on various noble adventures in fantastic lands. He searches, on this math quest, for magical flowers, returns gems to elves, and seeks to rescue the princess! All of this is done at our kitchen table while he plays MathRider. 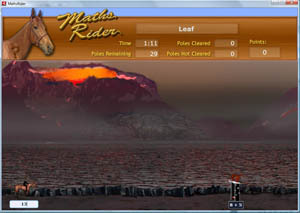 MathRider is a math game for children who need to learn their number facts. Drilling math facts no longer have to be boring. Whether you child is working on addition, subtraction, multiplication or division, MathRider can make the journey fun and successful. Each operation contains four quests, ranging from easy to master. While the rider is playing, the game learns what the rider knows and what he or she still needs to practice. Every single response (or non-response) is stored in an internal database and statistically analyzed by the software. In this way the program is able to custom-tailor to each rider, which questions are asked next. No repetitive drilling of random number facts the rider already knows – but real practice of what actually needs to be practiced! Visit the MathRider website to purchase this game for your children for just $37.00. To see what others are saying about this product click here. Disclaimer: As a member of The Old Schoolhouse 2010-2011 Crew, I received a trail version of this product in exchange for an honest product review. I do not receive any other form of compensation for the reviews posted on this blog.